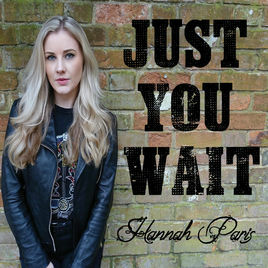 Essex based singer songwriter Hannah Paris is back with her new single, the attitude filled ‘Just You Wait’. The new single, released on the 14th March, is released on the back of a very successful Kickstarter campaign, when fans from across the world pledged more than 25% above the target to make the release a reality. Hannah hit the headlines last summer when her debut EP ‘Short Stories’ reached the top 10 of the iTunes UK Country Chart, this despite a relatively low-key launch. The EP took on a life of its own however and has since amassed an incredible 100,000+ streams on Spotify, making Hannah one of the most successful artists in UK country. Hannah only began to sing in her late teens and it was as recently as 2014 that she picked up a guitar for the first time. This move saw Hannah able to put her blossoming song writing career to music for the first time and has seen Hannah become the complete artist she is today. Hannah has had a busy few months. Two full band performances at the famous Hard Rock Café impressed so much that Hannah was recently named as a ‘Hard Rock Ambassador’. A recent acoustic performance at the ‘Corn on the Cob’ night on Hertford caught the eye of UK country website ‘Belles and Gals’, who Hannah is now working alongside on this single release. Looking forward to the rest of 2018, Hannah has been booked for a number of festivals, including the iconic Isle of Wight Festival.